The Coat Color Genes WEB has been updated. 79 new loci have been added as cloned and uncloned pigmentary genes. 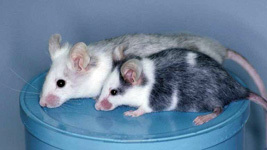 This site, hosted at the ESPCR WEB, now holds information of 210 genes that are directly or indirectly related to pigmentation, and also includes up to 84 mouse pictures, generously contributed by several ESPCR members and colleagues, illustrating the phenotype of some of these mutations.